The schedule and assignments for these dates is dependent on your class period's performance on the SAGE test. If scores indicate that more review is needed before the final, your class period will be working on additional review assignments during these days. If scores indicate that your class period is already well prepared for the final, you will be doing other enrichment activities. I already forgot the instructions I got in class. How do I wash my shirt?? Make sure the washer is empty. Cut the bags & ties off-- touch the shirt as little as possible-- the dye is still active! Squirt some (1-2 Tbsp) liquid dish soap (the kind you use in the kitchen sink on pots & pans) DIRECTLY into the machine. (NOT into a dispenser!!) Liquid dish soap (for the sink, not the dishwasher) is essential to the washout-process. It contains a chemical that deactivates the dye. If you & your mom are nervous, run it one more time as a rinse. Dry normally. Wear proudly. Tell people you have mad chemistry skills. *If your washer saves water by detecting the load size for you, it won't use enough water! You can either (1) Make friends with someone whose washer isn't as environmentally friendly as yours (double soap, large load) or (2) add a load of wash rags or dark towels to convince the washer you need more water. (Add extra soap to be safe.) If an extra rinse is an option, that's a nice idea too. Canvas: Final Review is due on the day of your final at 7:45 am. 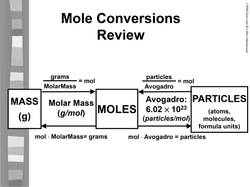 The complete MOLE CONVERSION SUMMARY is two pages, and includes molarity and molality conversions in addition to the ones shown above. Here is a STUDY GUIDE for the Unit 4 Test! You might want to REVIEW THESE CHARTS, which can help you decide which conversion to use. ​Need more help on your Mole Conversion Homework? Review the last few examples from the PowerPoint and/or check out this convenient printable copy of this summary from day 18 (this was the last page of the notes). Need help on your Mole Conversion Homework?